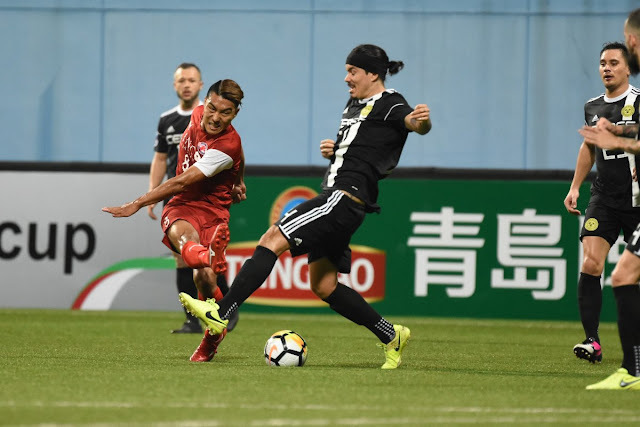 Home United can celebrate before their National Day, as they are the new ASEAN Zone champions of the AFC Cup after dethroning Ceres Negros with a 2-0 blanking in the second leg of the final tonight at Singapore's Jalan Besar Stadium. Already had an away goal when they first met in Panaad last week, a twelve-minute blitz on a pair of headers after the hour mark has passed gave the Protectors a 3-1 aggregate win in front of the 3392 supporters, with a clash with North Korea's April 25 in the Inter-zone semifinal being their reward. The Busmen will have to contend for just a domestic double as their treble hopes was shattered in the first two weeks of the new month, with the absence of Bienvenido Marañon in the continental competition hurt them in more ways than one. Stephan Schrock's form in the first leg gets him the starting nod, but questions will be surely raised to Risto Vidakovic when Amani Aguinaldo was put out of position at right-back when the Serbian still prefer the centre-half combo of Carli and Super Herrera. Negros had the better football in the first hour, taking majority of the possession and had more corners, with the Spaniard came closest midway into the first half with a header that went off the post. Tragedy struck for the visiting Busmen in the 36th minute when Patrick Reichelt left the tie on a stretcher after collided with Rudy Khairullah in the box, as the opening half ended goalless. However, Home showed the visitors how to finish with their heads, as Shakir Hamzah duly sent them ahead in the 62nd minute, shocking the sleeping Negros defence with a header from a corner by Izzdin Shafiq. Absent in the first leg, Korean midfielder Song Ui-young made his triumphant return by putting the the dagger with 16 minutes before full-time, heading home a Faritz Hameed cross on the open play.